Kathi Geilser, Committee Chairman, Bob Swain, Led the Walkathon, and Camron Johnson, Lee's Proxy walker. The disease that Lee was diagnosed with in the spring of 2001 is Primary Lateral Sclerosis (PLS). The only diagnosis for this diseases is through elimination of all other neurological diseases. This is a rare disease that affects the upper motor neurons. Simply - his brain is not talking to his body. He has a difficult time walking and no sense of balance. This disease is NOT life threatening (thank God) but life style. As it progresses he will have less and less use of his legs. Unfortunately, it will also begin to affect the rest of his body, too. Right now he is using a walker to walk and really just shuffles. But as he always says, "I just keep putting one foot in front of the other, fall down, get up and do it again." He was issued a wheel chair but is reluctant to use it. 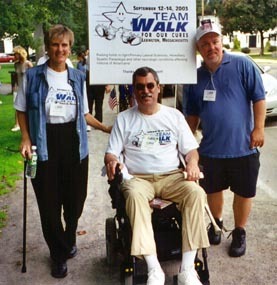 A good website that is devoted to this disease is "Spastic Paraplegia Foundation, Inc.". His sister, Carin, and her husband, Jim, and their children all pitched in and bought him an electric 3-wheel scooter to help get around in. It was such a surprise when Jim, Jr., from Florida drove up with it. We have built a ramp onto the back porch so later he can take it into the house. The family was able to purchase a 1992 Chevy Astro van that had been converted with a lift to carry the cart with. Marge is looking forward to it for then she can get him away from the farm and do things with her. Mark's father received an electric cart to help him get around but unfortunately passed away shortly after. When Mark and Tammy went up to CT for the funeral he requested and received the cart for Lee to use. This one is smaller and fits much better in the van. It works real well on flat surfaces like stores, restaurants, and such. So Lee uses the 3-wheel cart on the farm cause it is much more stable in the grass. He is out chasing the goats when they get out and fixing fence where he can and keeping active. Update........ In June 2009 we became "official old folks" as we started receiving Social Security. With it, we decided to buy a new handicap van. We (and the bank) bought a 2009 Chrysler Town & Country with the Braun Mobility conversion. It has a folding side ramp & the rear of the van lowers for much easier access. The front passenger seat comes out so Lee can be right up alongside Marge. In July 2010 VA gave him a new electric chair. This one is narrower for easier use in the trailer and it power reclines to all sorts of configurations. With this, if need be, he can sleep in it. It came at the most opportune time as his "walking" even with a walker was very unbalanced. For safety, he’s giving up even trying to walk. And with VA’s help we have converted our bathroom into handicap accessible. They took out the bath tub and vanity and put in a roll-in shower and a pedestal sink. Now Marge puts him in the PVC shower chair, rolls him in, takes the wire brush to him & scrubs him clean and dries him off. No fear of falling. With the pedestal sink, he can roll his new chair right up to it and brush his teeth and get cleaned up.